So much talent. So much potential. So many chances. So many expectations. So many temptations. So many challenges. So many mistakes. 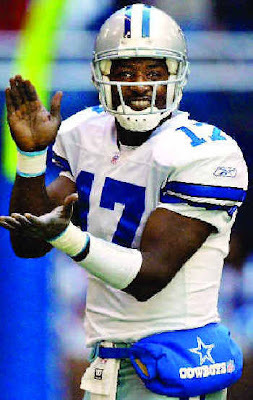 Such is the life of one Quincy Carter. You may add to the 'so list' above so many identities: a Bulldog, a Cowboy, a Jet, an Alouette, and a Brigade among probably others. He has just been activated by the Arena Football League's Kansas City Brigades as their backup quarterback. Another opportunity, this time with no expectations at all. In the post just before this one, I wrote how D.J. Shockley could really use a good break for a change. Now as I consider Quincy, I wonder how many more breaks will he get. He has been controlled by substances that have addicted his talented body. Was his time spent with former cowboy Thomas "Hollywood" Henderson rehab enough to sustain him this time? He states he has learned to live day by day because that is all he can handle. Handle it wisely QC. Even though there have been many thus far, there might not be another tomorrow.